We are constantly adding new materials to our collection. Below is just a highlight of a few we have added recently. 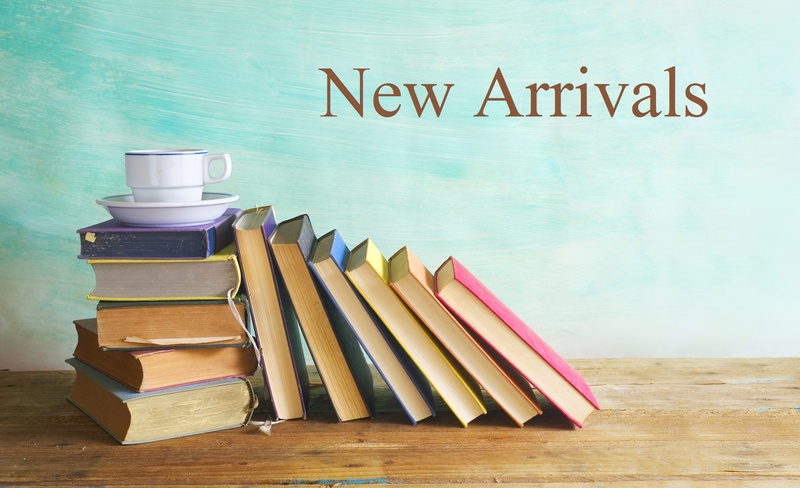 Come in or view our Catalog for all our new items. The Guardians' powers are given the ultimate test as they journey to the moon itself in this fifth and final chapter book adventure of an epic series. The Guardians come together to protect the childhoods of all who dream, and they are a formidable team: Nicholas St. North, E. Aster Bunnymund, Toothiana, the Sandman, Nightlight, and Katherine have thus far prevented Pitch from fulfilling his nightmarish plans. But Pitch and his nightmare men lurk on the fringes, gathering strength, stewing in hate, and the Guardians know their guard needs one more member if they are going to vanquish Pitch for all eternity. And once they find the last in their band, they'll travel to the secret realm of the Man in the Moon, encounter armies of Moonbots, and face the greatest battle since the Golden Age; and that is just the beginning of this grand conclusion to a series most grand. A lyrical biography of E. B. White, beloved author of Charlotte's Web and Stuart Little. When Mr and Mrs Burrow need a babysitter, they are not expecting Bear. But Bear is the only one who shows up, so Bear gets the job of babysitting for their 7 little bunnies who are full of mischief. Together, the bunnies persuade Bear to read a scary book, five them chocolate for dinner, and go crazy with the garden hose! But when the bunnies find Bear sailing the high seas in a make-believe ship, suddenly he isn't such a bad babysitter after all. Disaster strikes when a noble family visits their home and offers to take Emmeline away and cure her of magic. Desperate not to loose her shadows, she turns to Dar who proposes a deal: Dar will change the noble's mind, if Emmeline will help her become flesh as she once was. Emmeline agrees but the next morning the man in charge is in a coma and all that the witness saw was a long shadow with no one nearby to cast it. Scared to face punishment, Emmeline and Dar run away. With the noble's guards on her trail, Emmeline's only hope of clearing her name is to escape capture and preform the ritual that will set Dar free. But Emmeline's not sure she can trust Dar anymore, and it's hard to keep secrets from someone who can never leave your side. Dr. Zomboss erroneously believes that all humans hold a secret desire to run away and join the circus, so he aims to use his newly created "Big Z's Adequately Amazing Flytrap Circus" to lure Neighborville's citizens to their doom! Not only does starting a zombie circus prove difficult, though, but once plant- friendly neighborhood defenders Nate and Patrice infiltrate his show, Ringmaster Zomboss and his hapless zombies are in for a garden-ful of trouble! Lada Dracul has no allies. No crown. All she has is what she's always had: herself. After failing to secure the Wallachian thrown, Lada is out to punish anyone who dares cross her. She storms the countryside with her men, but brute force isn't getting Lada what she wants. And thinking of Mehmed, the defiant Ottoman sultan, brings little comfort to her thorny heart. There's no time to wonder whether he still thinks about her, even loves her. She left him before he could leave her. Lada needs the support of her diplomatic younger brother, Radu. But Mehmed has sent him to Constantinople- and it's no diplomatic mission. Mehmed wants control of the city, and Radu has earned an unwanted place as a double-crossing spy behind enemy lines. And for the first time in his life, when Lada asks him for help, he refuses... leading his sister to make the darkest of choices. Torn between loyalties to faith, to the Ottomans, and to Mehmed, Radu knows he owes Lada nothing. If she dies, he could never forgive himself- but if he fails in Constantinople, would Mehmed ever forgive him? As nations fall around them, the Dracul siblings must decide: what will they sacrifice to fulfill their destinies? Empires will topple, thrones will be won... and souls will be lost. In the Tale of the Fall of Gondolin are two of the greatest powers in the world. There is Morgoth of the uttermost evil, unseen in this story but ruling over a vast military power from his fortress of Angband. Deeply opposed to Morgoth is Ulmo, second in might only to Manwe, chief of the Valar: he is called the Lord of Waters, of all seas, lakes, and rivers under the sky. But he works in secret in Middle-earth to support the Noldor, the kindred of the Elves among whom were numbered Hurin and Turin Turambar. Central to this enmity of the gods is the city of Gondolin, beautiful but undiscoverable. It was built and peopled by Noldorin Elves who, when they dwelt in Valinor, the land of the gods, rebelled against their rule and fled to Middle-earth. Turgon King of Gondolin is hated and feared above all his enemies by Morgoth, who seeks in vain to discover the marvelously hidden city, while the gods in Valinor in heated debate largely refuse to intervene in support of Ulmo's desires and designs. Into this world comes Tuor, cousin of Turin, the instrument of Ulmo's designs. Guided unseen by him Tuor sets out from the land of his birth on the fearful journey to Gondolin, and in one of the most arresting moments in the history of Middle-earth the sea-god himself appears to him, rising out of the ocean in the midst of a storm. In Gondolin he becomes great; he is wedded to Idril, Turgon's daughter, and their son is Earendel, whose birth and profound importance in days to come is foreseen by Ulmo. At last comes the terrible ending. Morgoth learns through an act of supreme treachery all that he needs to mount a devastating attack on the city, with Balrogs and dragons and numberless Orcs. After a minutely observed account of the fall of Gondolin, the tale ends with the escape of Turin and Idril, with the child Earendel, looking back from a cleft in the mountains as they flee southward, at the blazing wreckage of their city. They were journeying into a new story, the Tale of Earendel, which Tolkien never wrote, but which is sketched out in this book from other sources. Children today live in an unpredictable, disruptive, and often violent world. Many of them live in two different homes with different sets of expectations. They face bullying at school and online. They hear new of school shooting, and racially or religiously motivated violence. They may have lost a friend or a loved one. Cal Lynch travels back in time to 15th-centry Spain through a revolutionary technology that unlocks the genetic memories contained in his DNA. There, he lives out the experiences of Aguilar de Nerha, a distant relative who's also a member of the Assassins, a secret society that fights to protect free will from the power-hungry Templar Order. Transformed by the past, Cal begins to gain the knowledge and physical skills necessary to battle the oppressive organization in the present.